This project is concerned with legal norms and practices in various societies that existed in Asia Minor and Northern Syria during the 2nd and 1st millennium BC. The focus is on the cuneiform documents of the Hittite Empire (16th century to early 12th century BC) and the Lycian epichoric inscriptions from the 5th and 4th century BC. The thematic focus is on legal procedures and the institutional framework used to assert claims and sanction illegal action. The project is divided into three individual studies. The central question of this study is how the lawful use of Lycian tombs and funerary monuments was organised beyond the tomb owner’s death. The main focus is on the provisions made for the lawful use of the tombs after the owner’s death and on the nature and responsibilities of the enforcing institution. 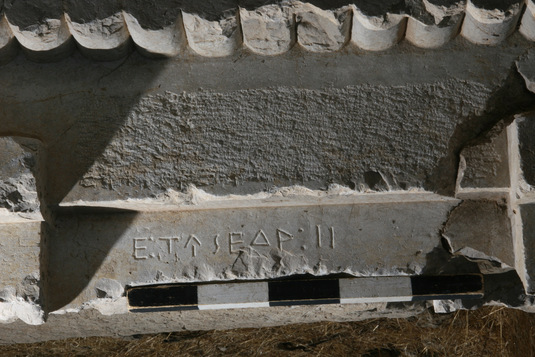 Besides previously published inscriptions in Lycian and Greek hitherto the project also takes into account unpublished texts, as well as architectural features of the tomb monuments. The analysis focuses on the much-discussed so-called ada formulae, which stipulate the payment of certain sums of money and are attested in numerous inscriptions, and the formulae that prohibit and sanction transgressions of the tomb owner’s provisions. 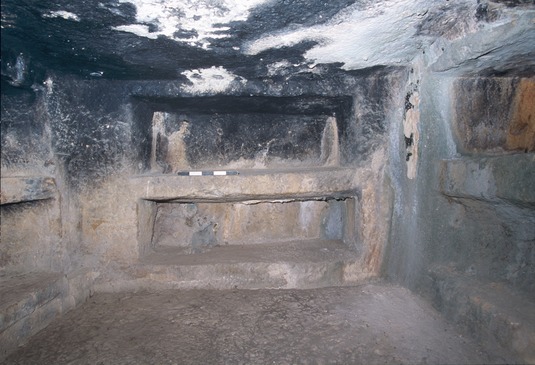 The study reveals that the stipulations of the ada formulae were intended to ensure the adequate use of the tomb chambers and a correct treatment of the persons entombed therein. All funerary monuments that bear inscriptions containing such formulae were evidently intended to accommodate multiple burials. With only few exceptions the inscriptions further explicitly define who was to be buried in the tomb, usually the owner’s wife and children. Correctly assigning these individuals their place in the tomb and probably also the performance of the burial was entrusted to an institution that is denoted in Lycian by the word miñti and in Greek by the loanwords mindis and menditai. This institution contractually committed itself under oath to carry out these tasks in exchange for a certain sum of money, the amount of which is rendered in the texts in ada or shekels. Statements found in the sanction formulae indicate that the members of the mindis were cult functionaries or priests of local sanctuaries. Besides their responsibility for lawfully assigning places of burial in the tombs and potentially also the performance of funerary rites, certain members of the mindis were evidently also charged with punishing the provisions made by tomb owners. Fig. 1: Fragment of a rock-cut tomb in Xanthos with a Lycian funerary inscription containing an ada formula (N 341). The first four lines of the inscription have been erased but the fifth line is almost intact. The traces of the erased letters can nevertheless be made out with the naked eye, although squeezes and photography fail to document them very well. Photo: Ludwig Fliesser, Corpus of Lycian Inscriptions project, Vienna, 13.09.2007. Fig. 2: Autopsy and film tracing of inscription N 341. The partially erased text in lines 1-4 could be almost entirely recovered (see fig. 3). Photo: Diether Schürr, 20.07.2007. Fig. 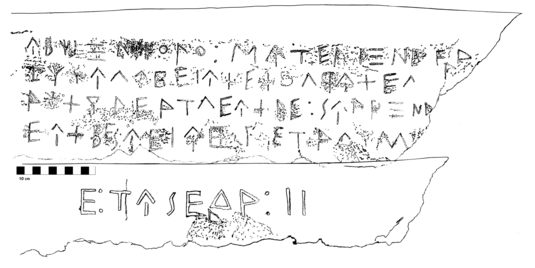 3: Hand-copy of inscription N 341 (Birgit Christiansen, 20.07.2009). Fig. 4: Transliteration and translation of inscription N 341 (Birgit Christiansen). Fig. 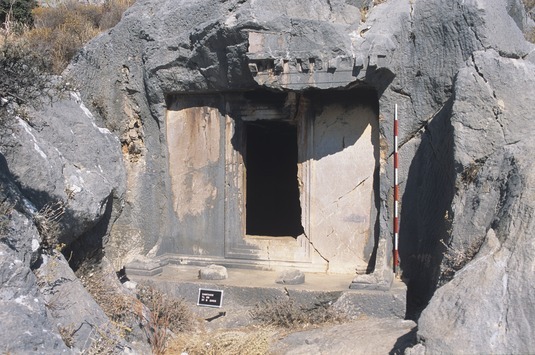 5: Façade of the rock-cut tomb bearing inscription TL 39. Photo: Regina Hügli, Corpus of Lycian Inscriptions project, Vienna, 21.09.2003. Fig. 6: Tomb chamber of the rock-cut tomb in Xanthos bearing the inscription TL 39. Photo: Regina Hügli, Corpus of Lycian Inscriptions project, Vienna, 21.09.2003. Publication: Grave Matters. Legal Provisions for a Proper Final Rest in Classical Lycia, in: Martin Zimmermann (ed. ): Xanthiaca. Beiträge zur Geschichte des Xanthostales in Lykien (Die hellenistische Polis als Lebensform), Heidelberg (forthcoming). The second study is concerned with the Hittites’ juridical principles of punishment and their historical development. The analysis focuses on the casuistic Hittite Law Code, which is extant in multiple versions from different periods of Hittite history. Over time, some aspects of the sanctions saw fundamental changes, and already the Old Hittite version refers to older provisions which have been replaced by the current regulations. The study’s core interest is in which transgressions incurred which punishments in what degree of severity and in how far specific principles and systems of values can be gleaned from this data. The study qualifies the general scholarly consensus by showing that many propositions of Hittite law are based on the law of talion. It was further demonstrated that the severity of the penalty imposed for homicide and certain kinds of bodily harm depends on whether the deed was committed intentionally, which is expressed by the Hittite word sullanaz, or on impulse, which is expressed with the phrase “his/the hand sins”. In previous research, the word sullanaz has generally been translated as “in a quarrel” or “due to a quarrel”, which implies that the term designates an intentional but not premeditated transgression, whereas deeds committed “by the transgression of the hand” were defined as negligent action. The study accordingly refutes the established interpretation which held that Hittite law does not contain special provisions for premeditated homicide, with the exception of the robbery and murder of a merchant. Publication: „Früher Bienenstiche. Jetzt aber gibt er 6 Schekel Silber“: Sanktionen und Sanktionsprinzipien in der Hethitischen Rechtssammlung, Zeitschrift für Altorientalische und Biblische Rechtsgeschichte 21, 2015, 31–101. The starting point of this study is the established hypothesis formulated in previous research that collective liability was far more common in Hittite law than in other cultures of the ancient Near East, but over time came to be increasingly supplanted by individual liability. This argument further holds that the Hittite sources document a process that is postulated in legal history as a universal development. This view is qualified here by the observation that previous studies failed to properly differentiate the different genres of the extant sources. Similarly, divine and human forms of punishment and the different types of transgressions were also not systematically differentiated with regard to the type of liability they incur. More precise and systemic differentiation shows that Hittite criminal law also hinged on the principle that only the person who had committed a deed was liable. The exception to this rule is provided by transgressions against the king, the royal family, and/or the gods. For these kinds of crimes, individual punishment is often supplemented with the threat or imposition of collective punishment. As a point of comparison, the study also incorporates sources from the “Neo-Hittite States” of the 12th to 8th century BC, as well as Lycian texts. This study will be published in a conference volume edited by Heinz Barta, which collects the contributions offered at an interdisciplinary conference held in December 2015 in Innsbruck under the title "Emergenz der Person – Entstehung und Entwicklung des Subjekts in Gesellschaft und Recht der antiken Welten".